A crisp colorful slaw adds a tangy element to any meal. 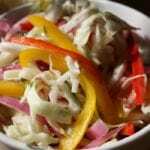 This Bell Pepper and Cabbage Slaw is an ideal addition to your next barbecue or parkside potluck. This dish is so flexible it compliments almost any protein. Use it to top tacos or serve it with burgers, grilled chicken, fish, and just about meat that you can throw on a grill. By omitting ingredients like mayo or sour cream this healthier cabbage slaw won’t throw your healthy meal plan off the rails. 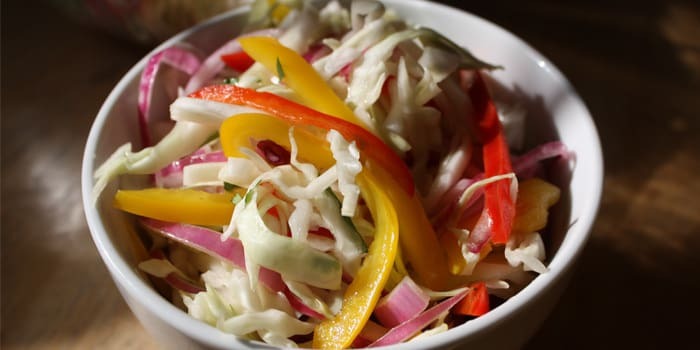 This healthier Cabbage Slaw is a perfect compliment to almost any protein featuring colorful bell peppers, red onion, and tangy rice wine vinegar.